make one with no knot tying involved! cowgirl theme for my two year old grand daughter. fabric strips in knots onto elastic or ribbons. different opinions about the best way to tie the knots. I decided to try a different way to make the fabric tutu. It turned out to be very easy and quick! Morgan with her cowgirl boots and tutu. She will have more cowgirl accessories when she wears this for Halloween. the top of the strip to run elastic or ribbon through. The result is a less bulky and more uniform waistband. a teenager or adult will need more). you choose to make it with. You can cut the strips in any width you want to. I thought that about three inches looked best. width plus 1/2") for the loop. For the two year old, I made the strips 13 1/2" long. and glue (or sew) along the edge of the fabric. The elastic I used was 3/4" so I allowed about 1/2" for the glue (or sewing) to secure the loop on the fabric. elastic unglued next to the fold. any difference (I could not tell a big difference). They both seemed to be holding well. The "Liquid Thread" came from JoAnn's. Originally $10 but I used a 50% coupon. washable. The Alleene's glue is not washable. unravel a lot in a washing machine or even hand washing. Oooppps! The loop in the picture is out of focus...my bad. Anyway you get the idea...only glue the edge. You can decide how full you want the tutu to be. The ones I made had 30 to 40 strips each in them. that says "non roll" works better for this project. Only $2.29 at JoAnns in the sewing notions area. to keep them from sliding off of the end. run through the fabric loop. 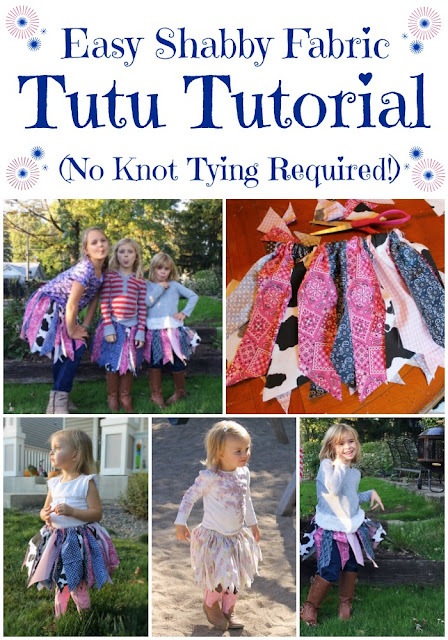 without the bulk of tying fabric strips into knots. This method also has all of the "good" or "right"
side of the fabric facing outwards. (beyond actual waist size) to overlap for pinning the ends. up but not too tight. popping open...not good for the wearer or the tutu. but it may need to be re-tied with a lot of activity. move to get wider or narrower as needed. The above photo shows the back of a tutu made with ribbon waistband. along the ribbon they naturally "come together" when the tutu is tied snugly on the wearer..
a little bit of sewing overlapped ends together. made on a sewing machine instead of gluing. on the waistband or you can do it in assembly line fashion. another if you are sewing them like they would in a factory. through the loop without measuring. 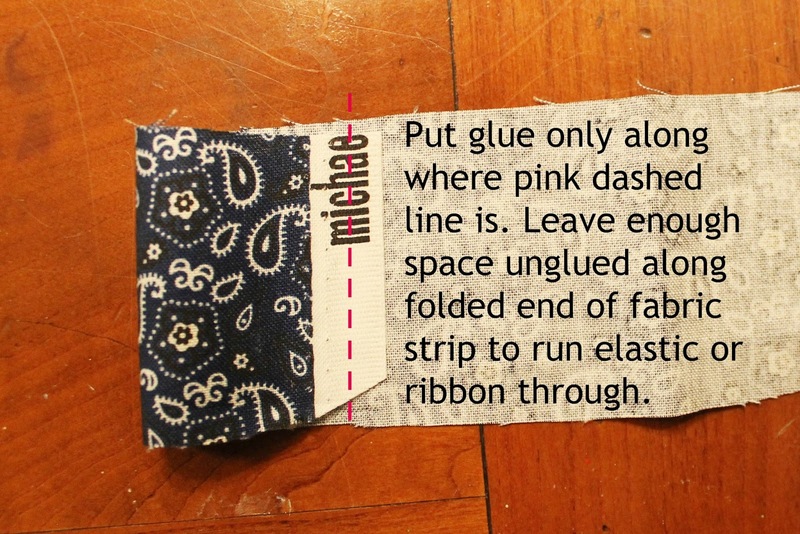 Just be sure you don't "catch" or sew the ribbon if you decide to try this method. off the other end of the ribbon. but nothing about these tutus has to be exact. 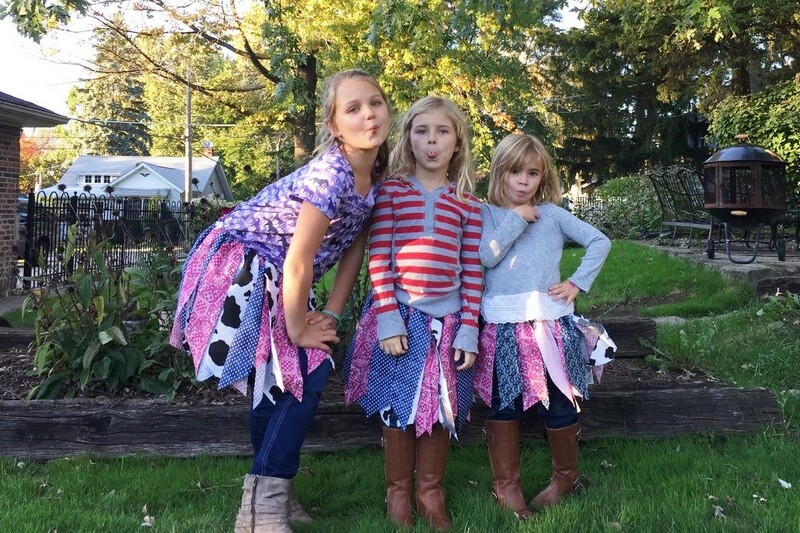 These tutus are SO easy with the glue OR sew method. The two taller girl's, Lilly and Maggie, tutus strips started out as 16 1/2" long. Bernadette's tutu strips started out as 15" long. Life is just more fun in a tutu! These tutus would be a good girl party craft. Just have the fabric strips ready to go and the girls could string them on a long ribbon. was all one fabric but constructed the same way. I'm adding this picture since it is hard to see the pattern of the fabric in the photos. 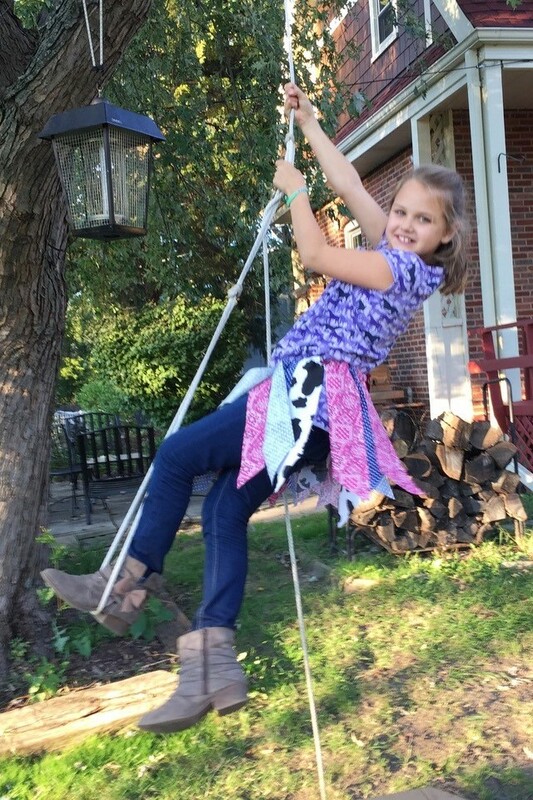 with her pink cowgirl boots, leggings and a t-shirt. strips are not finished off, there will be fraying. Just cut off the strings if they bother you. On that tutu I cut each strip into a "fishtail" shape. a cute, fun and easy tutu. Girls like them all year long! Oh wow! 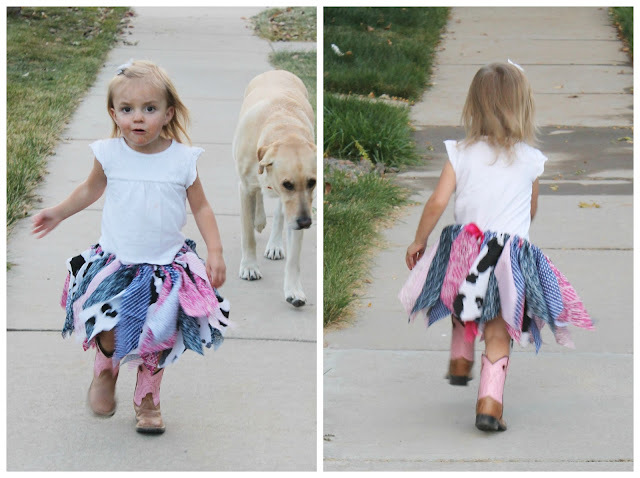 How adorbale are these with the cowboy boots! Thank you for hosting at Home Sweet Home!